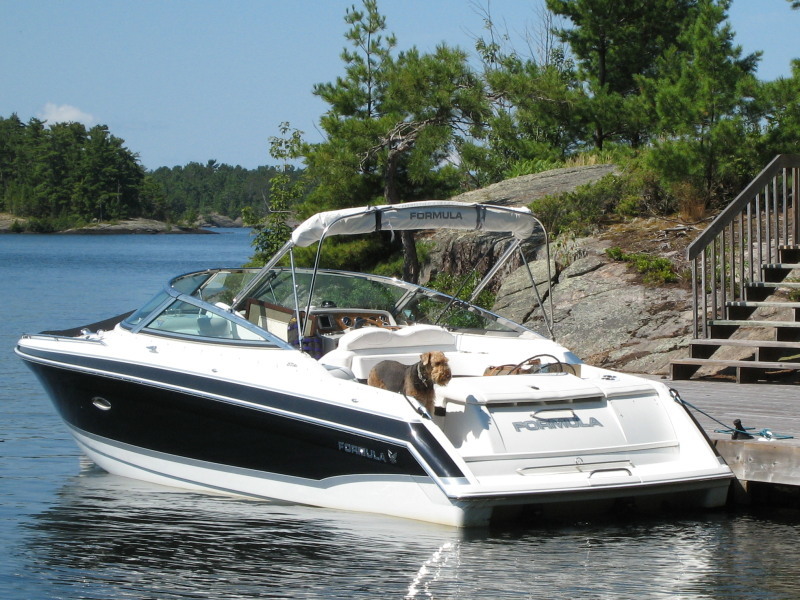 Power Boat Guide says: "It's all about fun with the Formula 280 Bowrider, a well-built boat big enough for the ocean but small enough to trailer to local lakes and rivers. Built on a deep-V hull, the 280 is distinguished for her attractive styling, roominess, and easy handling. She’s not the least expensive big bowrider on the market, but the quality is there, and it’s no secret that Formulas are built to last. Seating includes a flip-up double helm seat, double companion lounge, and a big U-shaped settee in the cockpit that converts to a sun lounge. Storage for fenders or dive tanks is located under the passenger seat, and a deluxe cockpit galley with sink and storage is standard. The enclosed head includes a sink and opening port. Forward, filler cushions can turn the deep bow section into a huge sun pad."